Christmas is such a fun holiday with so many amazing traditions! Last year we started a couple brand new traditions and I’m excited to make them even more exciting this year with this fun Christmas teepee! 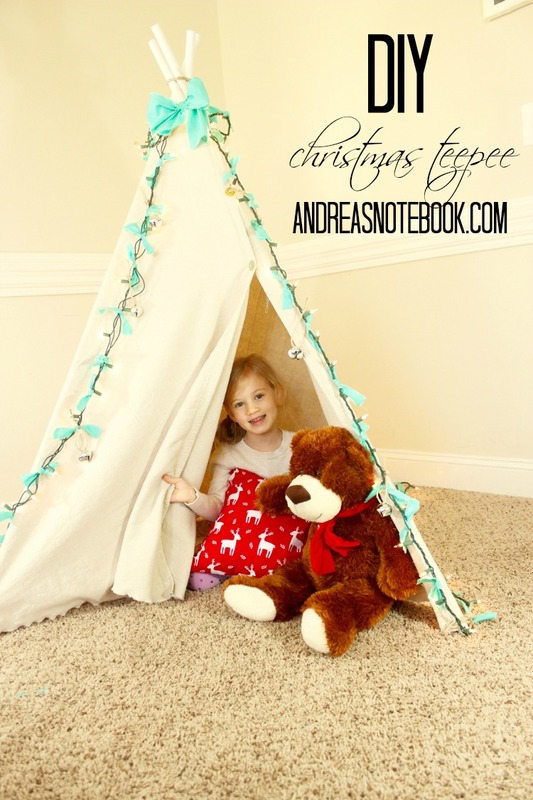 Make memories in a DIY Christmas teepee! Imagine reading Christmas books by a strand of Christmas lights. Having a Christmas campout. Christmas cuddle time in a little Christmas teepee! 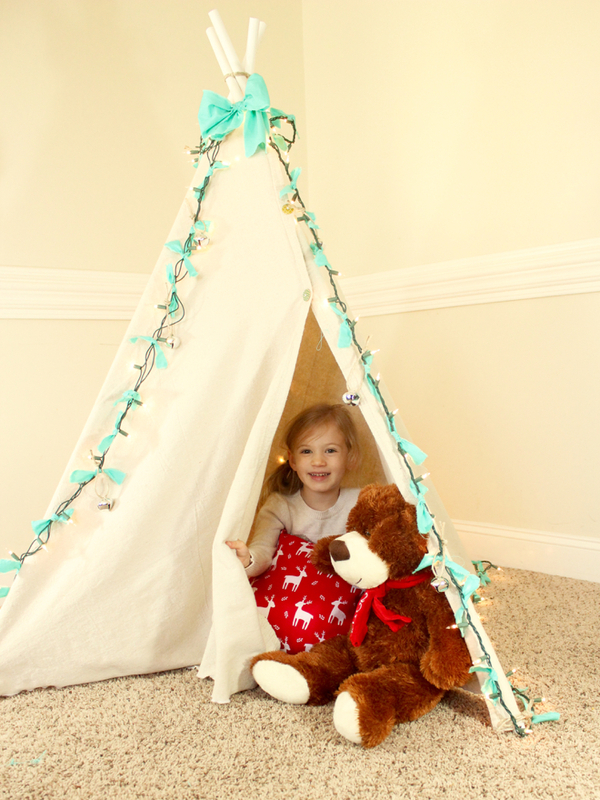 We’ll be making lots of memories this Christmas with this little DIY teepee. My kids were ecstatic when they figured out what kind of shenanigans I was up to today! 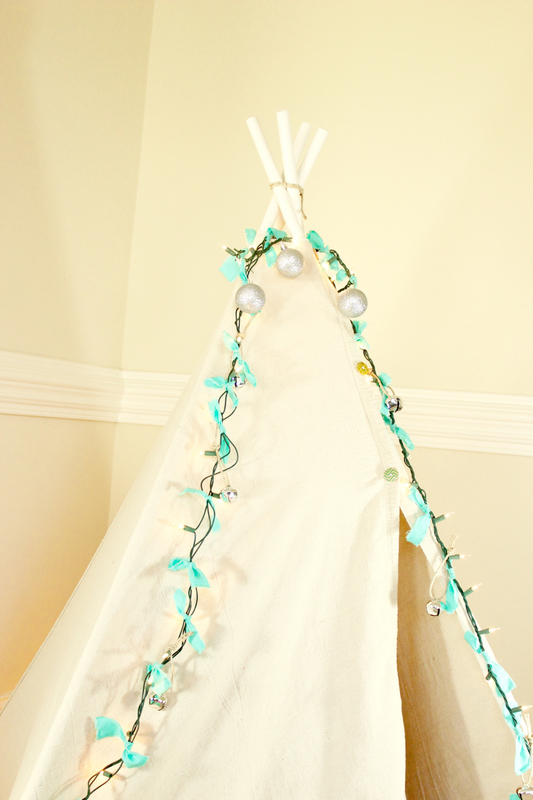 It wasn’t hard at all to throw this cute little teepee together–it took a little less than an hour after figuring out exactly how I wanted to put it all together. What was hard was taking good process pictures so that I could help you do the same! So I ended up re-doing my pictures on a small scale so that you could better see and replicate the process yourself. 1. Lay out your rectangular drop cloth (fabric). 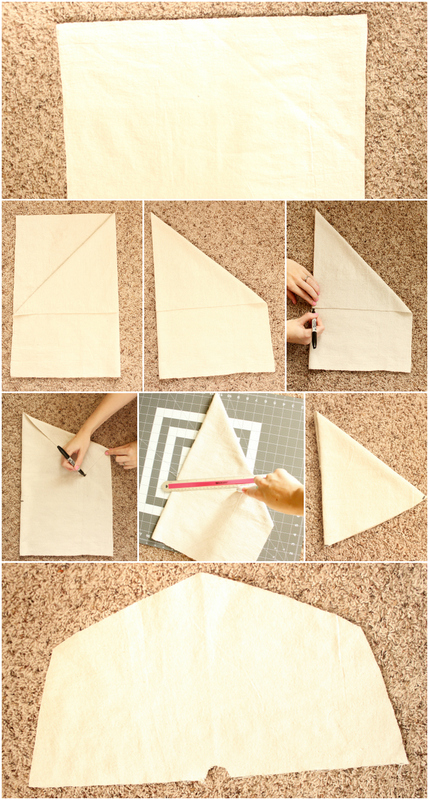 Fold in half then fold each corner to the center, just like you would if you were making a paper airplane. 2. Fold in half and mark where the edge ends on the center line. Fold top edge to diagonal line and mark where it ends again. Fold the top flap underneath. Draw a straight line from diagonal mark to the center mark. 3. Cut straight along line through all four layers. Cut straight across the top as well (just an inch or two) to create a small opening for your poles. 4. Serge along all the edges to keep the fabric from fraying. 5. Along one of the finished edges, sew an elastic loop about every 6-10 inches so that you can slide the fabric onto the pole and keep the edge of your teepee in place. 6. In each corner, attach an elastic loop about an inch away from the bottom edge. This will attach to the bottom of each pole keeping the fabric in place. 7. Pin the two finished edges together and sew starting at the top about 1/3 of the way down. If you want to attach some cute buttons at the top, you can! 8. 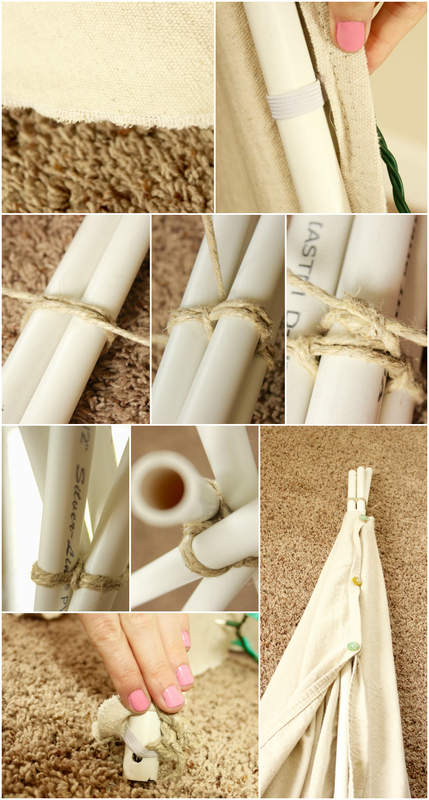 Grab your twine and wrap it around all four poles near the top and tie a knot. The poles should be tight together. With the tails of the knot, lash it between the poles forming a plus and pulling the outer loop tight. Tie off ends in a square knot and voila! You are ready to put it all together. 9. Lay your fabric down and carefully push all four poles together through the top opening. As you slide, make sure one pole goes through all the elastics. 10. Spread the four poles out and attach the elastics in the corners. If you want some extra stability. Drill a hole in the bottom of each of the poles ideally before you slide the fabric on. 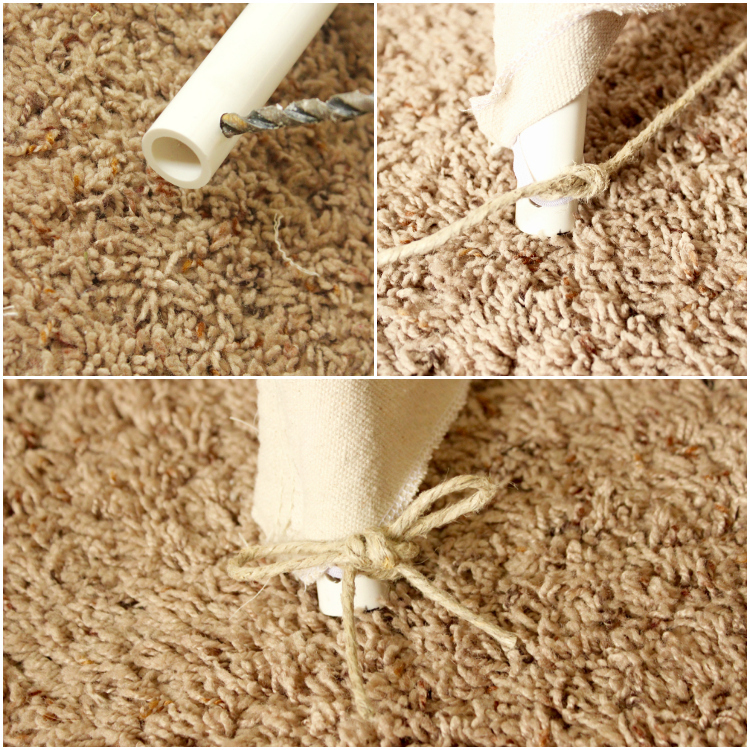 Then you can loop some twine through the hole and the elastic and make a square knot. 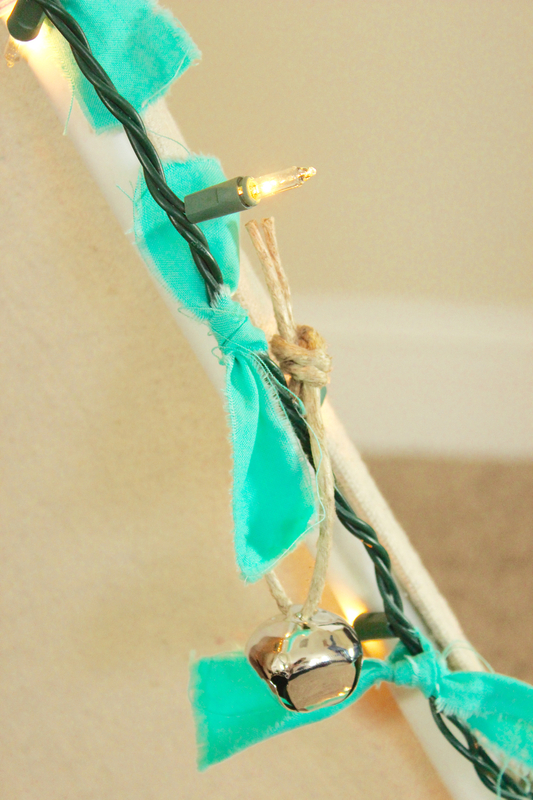 To decorate for Christmas, grab your Christmas lights, bells and twine, ornaments, etc. I like to brighten up my lights with a little bit of fabric. I just cut it into 3 inch strips and tie it into knots randomly. 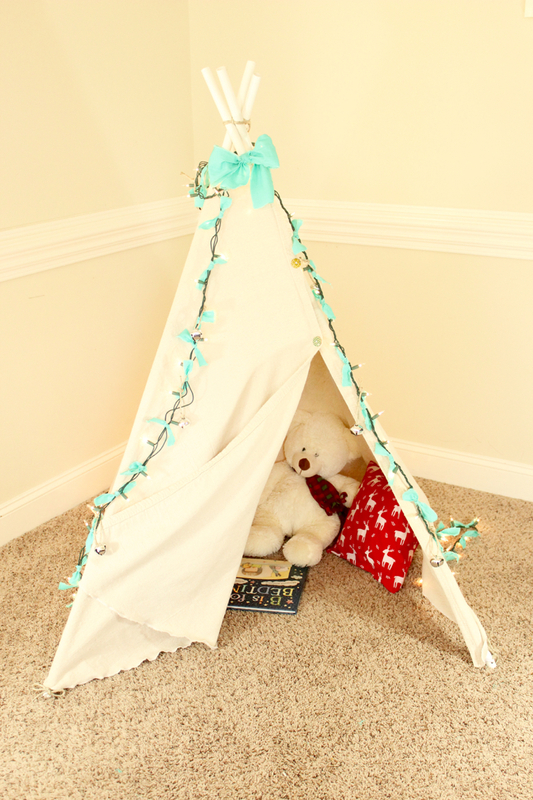 Don’t forget to add some fun pillows and stuffed animals to make your Christmas teepee nice and comfy!